Instead of designing one charger per battery type, or upon customer demand, we took the lead on designing chargers per operational usage (vehicle mounted, soldier portable, and maintenance) and not per battery type. The same charger supports all types of chemistry (NiCd, NiMh, Li-Ion), battery voltage and form factor. New charging profiles can be downloaded for charging capability evolution. 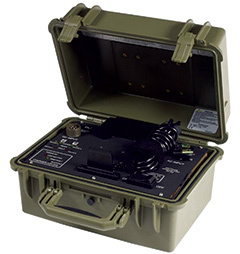 As of today, more than 70 different types of military battery packs are supported by Bren-Tronics Universal Chargers. Decades after the first universal charger, Bren-Tronics was awarded in September 2016 by the United States Marine Corps the Advanced Battery Charger program (ABC) which is the next generation of Military-Grade battery chargers. The Bren-Tronics Advanced Battery Charger is a portable battery charging solution that offers next-generation improvements in size, weight and efficiency, while providing selectable power, faster charging times, increased environmental survivability, and other significant innovations. Battery charging capabilities include, but are not limited to: BB-2590/U, BB-390B/U, BB-2557/U, Conformal Wearable Battery (CWB) and many others. Safety is controlled by the internal battery management system monitoring and balancing each cell in charge and discharge mode to prevent any internal electrical abusing. It is also guaranteed thanks to the state-of-the-art lithium-ion charging profile CCCV (Constant Current – Constant Voltage) integrated on all universal chargers.